A power of attorney grants one person the legal authority to act on behalf of another for certain purposes, which are usually stated in the document granting power of attorney. However, a person with power of attorney cannot take some actions on behalf of another, including signing the other person's will on her behalf. The power of attorney allows you to act on behalf of the person granting you power of attorney. The document that grants you power of attorney will usually specify what actions you can take on behalf of another person and how long your power of attorney will last. A power of attorney can grant only a few specific powers, or it can grant broad, general powers. In order for a will to be valid, it must be signed by the testator, or the person making the will. All states also require the testator's signature to be witnessed by at least two witnesses; Vermont requires three witnesses, and Louisiana requires a notary in addition to two witnesses. 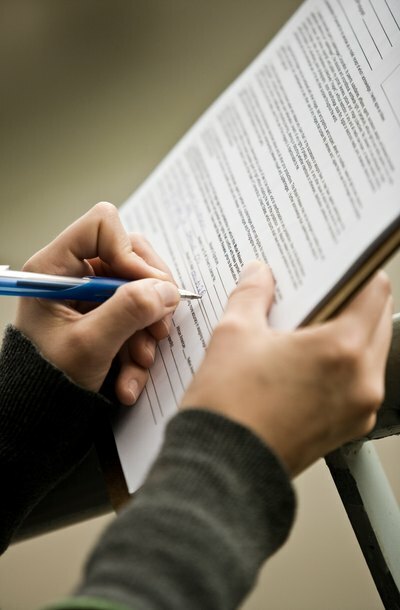 In all states, the testator must sign her own will or the court will declare the will invalid. When a probate court considers the validity of a will, it is usually considering whether or not the testator, or person making the will, had the capacity to make the will. The testator's signature on a will is considered evidence that the will is genuine, not a forgery. Without the testator's signature or with the signature of another person, like a power of attorney, the probate court is far more likely to consider the will a forgery. A handful of states recognize one exception, in extremely limited circumstances, for the rule that only the testator can sign his will. These states recognize nuncupative, or oral, wills. Even in these states, however, nuncupative wills can only be used in very specific circumstances, must be witnessed by at least two people, and must be reduced to writing and signed by the witnesses shortly after the testator passes away. If a person with power of attorney is one of the witnesses to a nuncupative will, she may sign the written version of that will as a witness, but she may not sign on behalf of the testator. ABA Family Legal Guide FAQ: Are there any requirements to make a will legally valid? California law requires that a testator, or the person making a will, be at least 18 years of age and of sound mind. The statutes regarding mental competency to make a will are more extensive than those in most states. Under California Probate Code Section 6100, the testator must remember and understand his relationship with his beneficiaries and his bequests to him. He cannot suffer from any mental disorder resulting in delusions or hallucinations if his will contains unexpected bequests, and there are other criteria, as well. What Constitutes a Legal Will in Pennsylvania?